What is Sajdah Sahw ? When is Sajdah-e-Sahoo Wajib or compulsory ? If those actions which are Wajib in Namaz are not performed by mistake, it is Wajib to perform the Sijdah-e-Sahoo to substitute for the action missed. Method of performing Sajdah Sahw? The method of performing this is, when you finish praying 'Attahiyat' in the last Qaidah, turn your head to the right side and then perform two Sajdahs. Then repeat Attahiyat from the beginning and complete your Namaz. Rule1: If a Wajib was missed and you did not perform Sajdah Sahw and completed the Namaz, then it is Wajib to repeat the Namaz. Rule2: If a Wajib is missed deliberately, then a to perform A Sajdah Sahw would not be sufficient and therefore it would be Wajib to repeat the Namaz. Rule3: If any of the Farz actions are missed, then Sajdah Sahw would not compensate for them and therefore the Namaz would not count and to repeat the Namaz would be Farz. Rule: If the actions that are Sunnat or Mustahhab in Namaz are missed, such as 'Ta'awwuz', 'Tasmee' 'Aameen', 'Takbeers when changing positions', the Tasbeehs (of Rukoo and Sijdahs) etc. 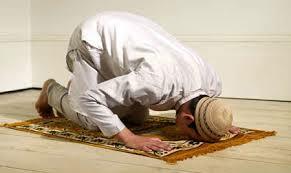 it would not make it necessary to perform Sajdah Sahw , but the Namaz would count [Radd-ul-Mohtar, Guniya]. However, it would be better to repeat it. Rule: If in the first Qaidah after Attahiyat and before standing for the third Rakat there is a delay as long as it takes to pray 'Allahumma Salleh Ala Muhammad' then Sajdah Sahw would become Wajib, whether you pray it or not, in both situations Sajdah Sahw would become Wajib [Durr-e-Mukhtar, Radd-ul-Mohtar]. Rule: If in Qiraayat etc at any time you start thinking and there is a gap long enough for someone to say 'Subhanallah' three times, then it would be Wajib to perform Sajdah-e-Sahoo [Radd-ul-Mohtar]. Rule: If you think that the first Qaidah is the last Qaidah in a four Rakat Namaz and you perform Salaam and then remember and stand back up and complete the Namaz, you must perform Sijdah-e-Sahoo [Alamgiri]. If you forgot to pause between actions then Sijdah-e-Sahoo is Wajib [Hindiya]. Rule: If a Muqtadee had not completed his 'Attahiyat' and the Imam stood up for the third Rakat, it is necessary for the Muqtadee to complete his Attahiyat, regardless of whether it causes delay. Rule: If the Muqtadee had not prayed the Tasbeeh in a Rukoo or Sijdah three times and the Imam finished it and stood up, it is necessary for the Muqtadee to stand up and not finish the rest of the Tasbeeh. Rule: If a person forgot to perform the first Qaidah and had only started standing up then he should sit back down and pray Attahiyat and the Namaz would be correct, a Sijdah-e-Sahoo would not be necessary. If however, he stood up and was close to completely, standing then he should stand up and continue with his Namaz and then finally perform Sajdah Sahw [Shareh Waqia, Hidaaya etc]. Rule: If you forgot to perform the last Qaidah and had not yet performed a Sijdah for the extra Rakat then you should sit back down straight away and perform Sijdah-e-Sahoo. If however, you had performed a Sijdah for the extra Rakat then except for Maghrib you can join another Rakat and they would all count as Nafl, because your Farz Namaz would not count and therefore you would have to pray the Farz Namaz again [Hidaaya, Shareh Waqia]. Rule: If in the last Qaidah you prayed Tasahhud and then stood back up, you should sit straight back down and as long as you have not performed a Sijdah for the extra Rakat, perform Sijdah-e-Sahoo and complete the Namaz. If however, you had performed a Sijdah in the extra Rakat, your Farz Namaz would still count but you should join another Rakat and then finally perform Sijdah-e-Sahoo and the last two Rakats would count as Nafl, but do not join another Rakat for Maghrib Namaz [Hidaaya, Shareh Waqia]. Rule: If in one Rakat you performed three Sijdahs or two Rukoos or forgot the first Qaidah then perform Sajdah Sahw . Rule: Order of sequence is obligatory in Qayam, Rukoo, Sijdah and the last Qaidah, therefore, if you performed Rukoo before you performed Qayam then this Rukoo is cancelled and will not count and if then you perform another Rukoo your Namaz will count otherwise it will not, and in the same way if you performed Sijdah before the Rukoo and then performed the Rukoo and performed the Sijdah again after, then the Namaz will count. Rule: Order of sequence is obligatory in Qayam, Rukoo, Sijdah and the last Qaidah meaning, whichever is due first should be done first and whichever is due next should be done next and if this done in,the wrong order then the Namaz will not count, for example, if someone performed Sijdah before Rukoo then their Namaz will not count, however, if they performed the Sajdah again after the Rukoo meaning they rectified the order of sequence again then their Namaz will count. In the same way if they perform Rukoo before Qayam and they stand back in Qayam and then perform another Rukoo, their Namaz will count Radd-ul-Mohtar]. All Qaidahs in Nafl Namaz are counted as last Qaidahs and therefore are obligatory and so if you forgot to perform a Qaidah and stood up then as long as you have not performed a Sijdah for the new Rakat sit back down and perform the Qaidah and then perform Sajdah Sahw and all Wajib Namaz are in the same rule as Farz Namaz, therefore if you forget to perform the first Qaidah of Witr then the same rule applies as a Farz Namaz [Durr-e-Mukhtar]. Rule: If you forgot to pray Dua-e-Kunoot or forgot to perform the Takbeer-e-Kunoot then perform Sajdah Sahw . Takbeer-e-Kunoot means the Takbeer that is said in the third Rakat after Qirat and is done and then Dua-e-Kunoot is prayed [Alamgiri].